Ford India will soon launch facelifted versions of its entry-level cars – the Figo hatchback and the Figo Aspire compact sedan. 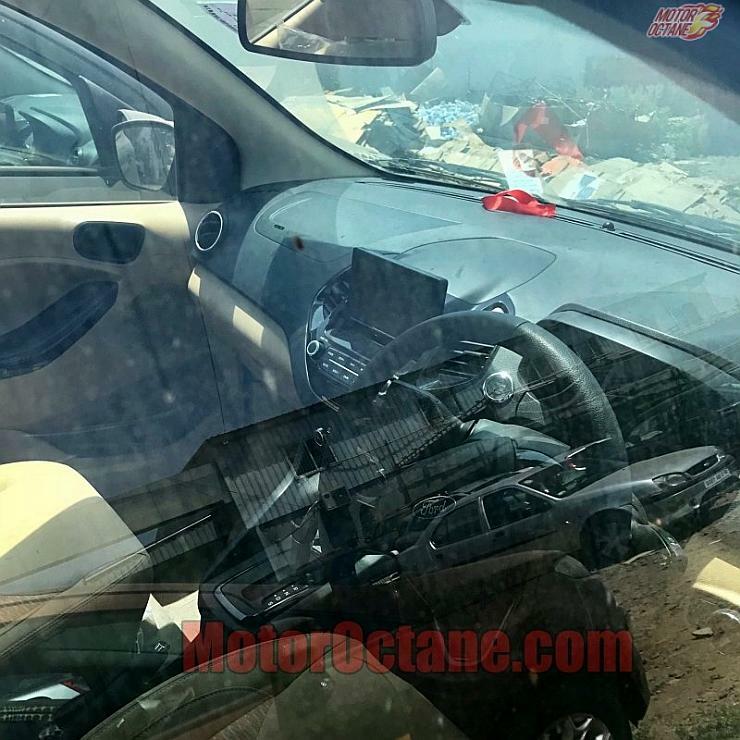 The facelifted Figo Aspire has been spotted testing in India. The spyshots indicate that the compact sedan will get a new front end, replete with a new grille and bumper. The rear also is likely to see a new bumper. On the inside, a touchscreen infotainment system will make it to the dashboard. Revised upholstery and other minor interior changes are also likely. The interiors will get a beige-black colour scheme. Mechanically, the facelifted Figo Aspire is likely to see major changes. The 1.2 litre Ti-VCT petrol engine is likely to be replaced by an all-new, Dragon petrol unit. The 3 cylinder, 1.2 litre Dragon petrol engine will produce class leading 95 Bhp-120 Nm outputs. A new 5 speed manual gearbox will be standard with this engine. 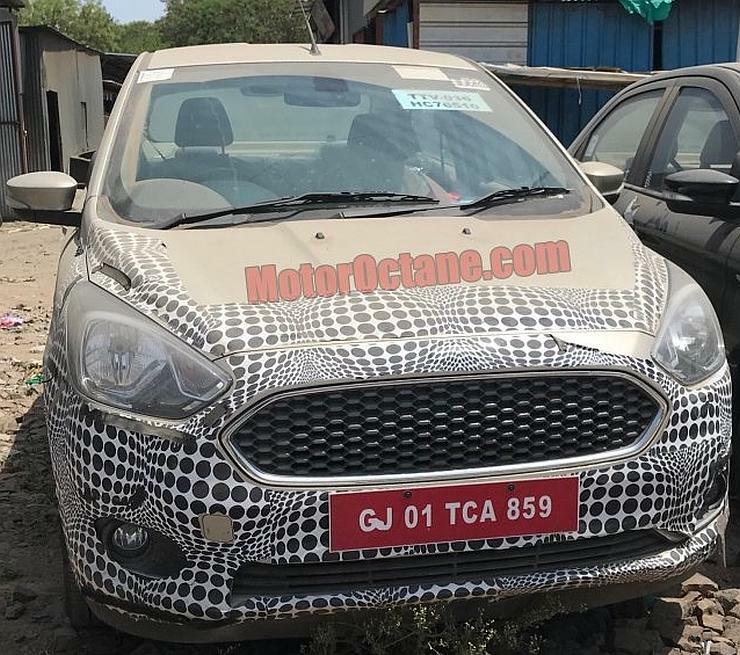 Ford is also likely to offer a larger, 1.5 litre-3 cylinder Dragon engine on the higher variants of the Figo Aspire, along with a 6 speed, torque converter automatic gearbox. The 122 Bhp-150 Nm outputs of the Dragon petrol engine is expected to make the facelifted Figo Aspire the most powerful compact sedan in its segment. The diesel engine will be unchanged though. The 1.5 litre TDCI turbocharged diesel motor with 98.6 Bhp and 215 Nm will be standard, along with a 5 speed manual gearbox. It remains to be seen whether Ford will offer the sporty S trim on the facelifted Figo Aspire. Like the Figo Aspire, the facelifted Figo will also get most of these changes. Considering the fact that Ford has priced the Figo-based Freestyle crossover so competitively, expectations of similarly sharp price tags for the facelifted Figo and Figo Aspire are now high. A starting price of about Rs. 4 lakhs for the Figo Facelift, and Rs. 5.2 lakhs for the Figo Aspire Facelift will give both cars massive appeal.